MLS Homegrown game: Who starts? Who plays? This past Monday, Major League Soccer announced plans to hold a homegrown game this year, playing it during the same week as the 2014 All Star game. Beyond that, details were scarce. Nothing was mentioned about format, opponents or anything else of that ilk, as MLS has plenty of time to conjure up something for this event. It's all on the to do list. So instead of waiting for a league announcement, TopDrawerSoccer.com is here to fill in the gap. Using our creativity and imagination (not really all the much mind you) we've come up with a simple format for the game, and who should be included. For starters, this shouldn't be a homegrown team against a U21 or U19 team from Europe. Bayern Munich, who is the 2014 MLS All-Star opponent, could potentially bring a youth side, but they would more than likely run roughshod over a young group of homegrowns, some of whom don't get regular playing time. Bringing back the East vs. West format could work very well in this game. Each conference has enough talent added via the homegrown initiative to at least make it competitive, and it would allow the league to maximize the number of former academy players to trot out on the field. With that format in hand, below is a list of 20 players from each conference who would be able to put on a show in a homegrown game, starting XIs included. 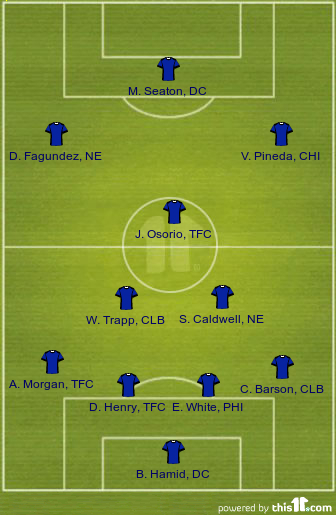 -Striker is a bit lacking here, though Diego Fagundez and Victor Pineda offer up firepower from the wings in what would be a 4-2-3-1 or 4-3-3. D.C.'s Michael Seaton hasn't seen a lot of first team action, but is an exciting option who could do a job leading the line by himself. -There's experience and quality in the midfield trio of Jonathan Osorio, Wil Trapp and Scott Caldwell. Osorio isn't a true No. 10, but offers up a slightly more offensive-minded game of the three. -Even though he was traded away from D.C. this offseason, Ethan White still qualifies for the game and deserves a starting nod in the middle in tandem with Doneil Henry. -A lack of good left back options means that Jordan Allen (normally a right sided player) could be an option at left back. He's an exciting talent, but could also make way for FC Dallas defender Moises Hernandez, who is more of a true left back. 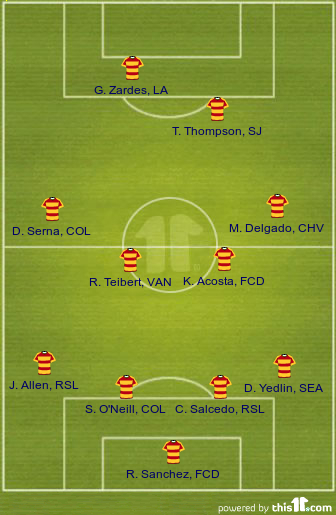 -There's a glut of options to partner with Gyasi Zardes up front, who could even slide out to a wide role if necessary. Caleb Calvert, Caleb Clarke and Jack McBean are all worthy of consideration. Tommy Thompson probably offers up the most exciting option. -Kellyn Acosta has played a lot of his MLS minutes as an outside back, though with DeAndre Yedlin available, Acosta can play in the middle of the park with Russel Teibert. That would make for a formidable central midfielder pairing. -U.S. youth internationals Dillon Serna and Markey Delgado are intriguing options. More about pinching in and making things happen on the ball than true wingers, they would add a unique element to each flank.